What is The Tritone Substitution? 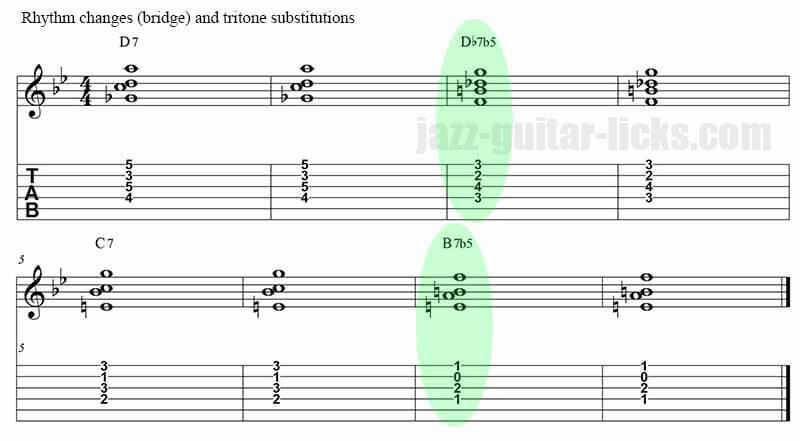 One of the most popular jazz chord substitution is the tritone substitution sometimes referred to as the dominant chord substitution. The most used is to replace the V with a dominant 7th chord whose root is a tritone below. Example with G7 (V), which can be replaced by Db7 a tritone (Three whole-steps) away. Thus giving two chords that have two notes in common. The 7th of G7 (F) is the third of Db7 and the third of G7 (B) is the seventh of Db7. The inversion of the 3rds and the 7ths between the original dominant chord (V) and the substituted dominant chord (bII7) is the main feature of the tritone substitution. If the most common tritone substitution involves two dominant chords, there are other chords that can be substituted as the vi chord, the ii chord, and the iii chord. You can substitute any chord which has its roots the flat fifth of the original chord. The type of chord used depends on the melody and the desired harmony. The tritone substitution can also change qualities from the chord it is substituting. Provided that the melody indicates no strong preferences for chord type. For example, dom7 chords can be played in place of minors. This could be subject of another lesson. Meanwhile, this article is focused on dominant seventh tritone substitutions. Here are some examples of tritone substitutions with a II-V-I progression : Dm7 | G7 | Cmaj7. The bII7 chord (Db7) can be in place of the G7, thus giving Dm7 | Db7 | Cmaj7. This is an intense sound, because with this kind of substitution, the root of the chord is chromatic. With this kind of substitution we also get a bass line of notes descending by half steps (D to Db to C). This kind of downward trajectory emulates a gravitational pull towards the tonic chord. It is a desirable and featured sound in jazz. ​Dm11 in place of the basic Dm7, Db7 (tritone sub) and Cmaj7. Dm7, Db7#9 and C69. You can alter the bII7 chord to add harmonic interest. In this case Db7 is extended with a #9 (F). The most common example of a tritone substitution is to substitute the V7 chord in a major key (it can also occur in a minor). 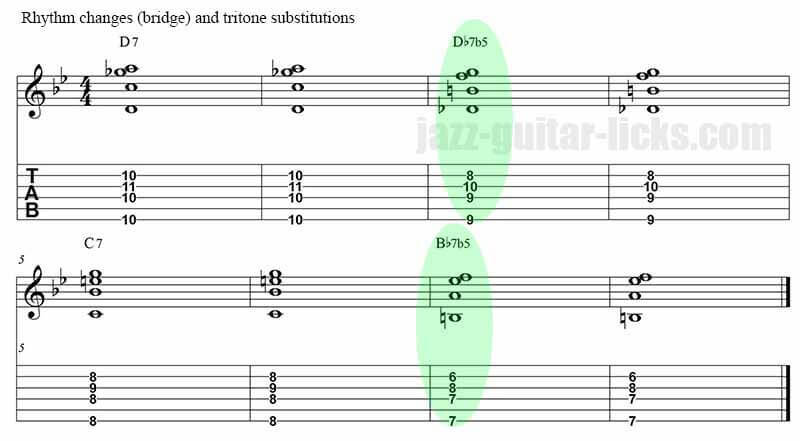 The following chart shows you the tritone subs related to the V of II-V-I progressions in all keys. The I-vi-ii-V (pronounce one-six-two-five) chord progression is one of the most common chord sequences found in jazz. Many jazz standards use the I-vi-ii-V progression and very often as a turnaround (Remember that a turnaround is a short chord progression which brings you back to the beginning of a piece). Here are three examples. The first contains the basic chords of a turnaround in the key of C. These chords (drop 2 and drop 3 voicings) are Cmaj7 (I), Am7 (iv), Dm7 (ii) and G7 (V). This second progression is the same as the previous I-vi-ii-V but the V (G7) is replaced with Db7 (bII7) which is the tritone substitution for G7. Sometimes the bII7 chord can be altered with the flat fifth provided that it resolves. It is a common trick when you want to spice up the tritone substitution. Just play a Db7b5 chord (bII7b5) in place of the original dominant 7th chord (G7). This way it is closer than the original chord. As it is shown in the chart below the V (G7) and the bII7b5 (Db7b5) have three notes in common (G, B and F). Now try to lower the fifth of G7 (D becomes Db) and you'll see that Db7b5 and G7b5 are made up of the same tones. This is the principle of the symmetry. It means that you can replace G7 with G7b5. This could give some new possibilities to enrich a harmonic progression. Here are two examples, based on the previous I-vi-ii-V sequence, with two G7b5 voicings. You can take a look at the page about drop 2 dominant flat five voicings to learn different positions on the guitar neck. You can also apply the previous harmonic tricks to the bridge (circle of dominants) of the famous 32 bars referred as rhythm changes. In the key of Bb bridge is D7 G7 C7 F7. After applying the tritone substitution on the the seconds and fourth chord, it can become D7 Db7 C7 B7 or D7 Db7 C7 B7 or even D7 Db7b5 C7 B7b5. 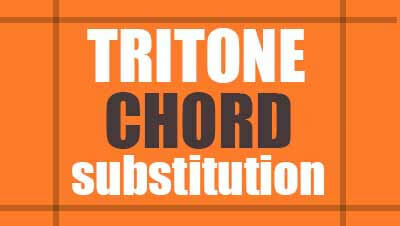 You can also apply the tritone sub on the first and the third chord, it gives D7 Ab7 C7 Gb7 or D7 Ab7b5 C7 Gb7b5. Of course there are many opportunities. I have recently heard that your guitar preparing program. Music is my life and i am extremely attached to guitar. I have purchased a guitar for me and i need to take in a great deal of things and i am looking a considerable measure of data about guitar. Your article is so educational and imperative to me. i can take in a considerable measure from,your article. Guitar tuning is not simple. Be that as it may, if any amateur practices he or she can learn and do those in a simple manner. So continue sharing this sorts of article.